Does Toughness Matter in PvP? The effect of Armor (toughness) in PvP is a tricky subject and isn’t very easy to test. Is it worth having a maximum Armor rating, sacrificing Recovery and/or Agility? This guide will hopefully answer that question while also shedding some light on how Armor works and what your focus should be on. What is Armor? What is Health? Note: Armor in this guide refers to toughness; the class stat. While this may seem obvious to some, it’s important to understand exactly what affects armor and how it helps us. As Reddit user CaptainChaozZz noted in this analysis, Armor does not affect health, but does affect the shield. It appears that every Guardian has roughly 105 health points; the shield points will vary though. In other words, it doesn’t matter if you have maximum armor or not, the amount of health you have will stay the same, but the amount of shots you can take before your shield breaks will vary based on Armor rating. Warlocks can increase their armor with their skill tree up to +7, Hunters up to +8, and Titans are the only ones who can get +9. Armor will increase the amount of hits your shield can take. A difference of 15 shield points between lowest and highest Armor rating is almost insignificant in most circumstances, but there’s a few instances that it can save your life, especially if coupled with The Ram helmet. This new exotic Warlock helmet not only triggers Life Steal on all your Voidwalker melees, it also increases Armor, making it useful even for a Sunsinger. 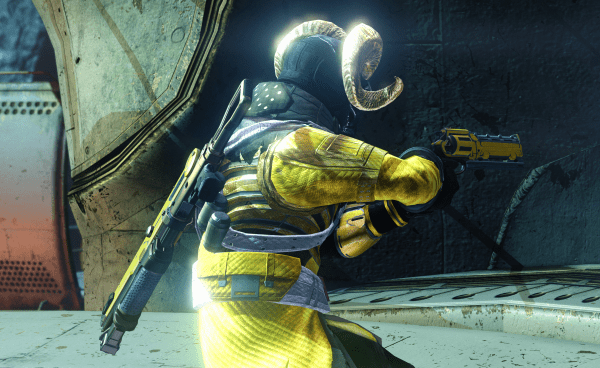 Sunsingers will also benefit from this helmet, because they are able to survive a headshot from an LDR-5001 or a Golden Gun shot during Radiance without having to use Radiant Skin, while wearing The Ram. With the weapon balance changes to most weapon classes and some Exotics, how will this change the importance of Armor? Bungie stated that Pulse Rifles with a medium RoF will either require 2 or 3 bursts-to-kill, depending on an opponent’s Armor stat. While Guardians with +8 armor can already survive two headshot bursts from Pulse Rifles like the 55A-Allfate, guardians with +5 armor will most likely be able to survive two bursts to the head after the update. Bungie also stated that Thorn’s DoT will be reduced to 1/3 of its current damage, but will also be stackable. If we assume that the reduction will be exactly 1/3 of Thorn’s DoT damage (14 damage), then 2 critical shots will not kill a player with +7 armor. However, it is more likely that they will reduce Thorn’s DoT to 12 damage, because then it could deal 3 damage over 4 seconds. This would imply that a player with +5 armor would not die from 2 Thorn headshots. Max Armor – Worth It? This choice obviously depends on you and the amount of Agility and Recovery you are willing to sacrifice. Opting for high/maximum toughness only gives a slight boost to your survivability, but Agility and Recovery however can do that as well. The question remains: Which is most useful? The most obvious reason to go for high Armor is the Gunslinger’s Tripmine. Having at least +6 armor will let you survive them from full health, which is very useful, because of the Tripmine’s popularity. If you don’t have access to The Ram, maximum Armor might not seem as such an important quality since the benefits aren’t as great. If you’re a Titan, since Armor is already naturally high, we recommend not increasing it further. For the other classes, being flexible is usually the best option. Adapt to your opponents by inspecting them, especially in Trials of Osiris or other 3v3 gametypes, and see how beneficial it is to have a higher Armor rating. As always, be sure to share your thoughts about low/high armor in the comments, and let us know what you prefer!